Petite Noir – We define what's next — inspired by Africa. Amidst the rapid globalisation of sounds hailing from African soil, South African musician Petite Noir introduced the world to the emergence of his ‘Noirwave’ sound; a movement that simultaneously adds flavour to the musical and creative diversity of the continent. Born in Brussels, Belgium to Angolan and Congolese parents, Yannick Ilunga’s music is a collision of many influences as the artist grew up becoming a product of his diasporic environment. While briefly touring with Solange in 2013, his first break came with the release of his first EP The King of Anxiety and his debut album La Vie Est Belle/Life Is Beautiful, both released in 2015. With a track list that draws inspiration from jazz, indie rock and post punk elements as well as guitar rhythms and live drums common in Central and West Africa, Ilunga’s music is hard to classify yet breaths fresh air into the commercialised Afrobeat-heavy sound that’s taking the world by storm. In 2018, he released his EP La Maison Noir/The Black House, which was completed with visuals by creative director, his longtime collaborator and wife Rochelle ‘Rharha’ Nembhard. This visual album journeys through the formative stages of Petite Noir’s life, with references to the four elements of fire, earth, water and air. While touching upon subjects such as resistance, migration and women’s rights, La Maison Noire is a four-part visual EP complemented with imagery referencing to the musician’s personal Congolese cosmogram (Kala, Tukula, Luvemba and Masoni), each element symbolising rebirth.”We all go through a rebirth every few years”, he told ELLE. 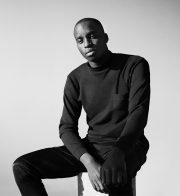 In 2012, Petite Noir established ‘Noirwave’ together with Rharha Nembhard. This philosophy ‘responds to current cultural movements centred in Africa’ by giving today’s generation a voice within the community to not rewrite the African narrative, but rather offer a new one. ‘These are narratives that represent the variety of experiences across the continent’, Ilunga explains on his Instagram. This movement often gives Petite Noir’s music a political edge as he dissects a larger metaphor of what it means to be an immigrant and to walk through the world with a hyphenated identity – his song ‘Blame Fire’ being a perfect example of that narrative.